Download MP3 songs and albums complete movies and tv series tv episodes video on demand videogames ebooks and digital books digital magazines digital newspapers and many more digital products. Downloads are fully compatible with PC Mac IPhone IPod any digital cellular phone Kindle and other ebook readers. 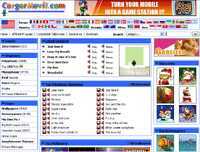 CargarMovil.com All Mobile is a free software with everything digital you may ever need including tens of thousands of MP3 songs movies games video on demand and more. Search your favorite digital product and download it to your PC phone IPhone IPod or Kindle in just seconds. All Mobile is as easy to use as 123 and has the most complete digital content on the net including downloads that you will probably not find anywhere else. The software allows you to view the movies or listen to complete songs before downloading them to your device. With CargarMovil All Mobile software the best games are just a click away with ratings and real time game demos available. Your daily digital downloading can be a lot of fun with All Mobile software from CargarMovil.com. Enjoy it! New version adds functionality to download albums movies games and ebooks. Supports IPhone Ipod Kindle and other book readers.